Melting moments biscuits are always popular, so a double chocolate version is bound to be a success - with little pipers and grown-ups, too. This easy recipe is perfect for keeping the children occupied (they will love piping out the biscuit mixture), with a little help from you. Preheat the oven to 180°C, gas mark 4 and line a large baking sheet with baking parchment. Place the butter, sugar and vanilla in a bowl and beat until light and fluffy. Sift in the flour and cocoa and fold in until combined. 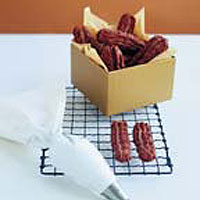 Place the mixture in a piping bag fitted with a fluted nozzle and pipe 32 x 4cm lengths onto the baking sheet, allowing room for spreading. Bake for 12-14 minutes, or until just starting to become darker around the edges. Remove from the oven and leave to cool on the sheet before moving to a cooling rack. To make the filling, combine all the filling ingredients with a teaspoon cold water and beat until smooth and creamy. Spread over half of the cooled biscuits and sandwich together with the remaining halves.